UNITED NATIONS, June 14 -- Mexico's claim that 90% of guns enter its country from the United States was questioned at the UN on Monday. Inner City Press asked the managing director of the Small Arms Survey, Eric Berman, about what percentage of guns in Mexico come from the United States. Video here, from Minute 23:12. Berman answered that contrary to Mexico's 80% to 90% figures, "there's a little problem in how the numbers are determined." He said the Mexican government has seized thousands of weapons, they selected a subset to send to the US... Another subset, those able to be determined by serial numbers, leads to a percentage 'from the US.' But the headline "skews the information." 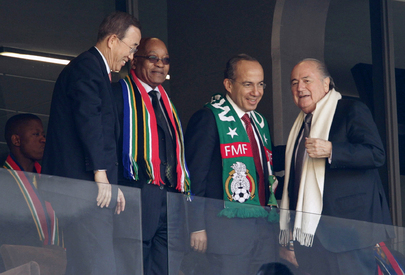 Berman said they have "shared the information with the government of Mexico." Our estimates have been corroborated on various occasions by the US Bureau of Alcohol, Tobacco, Firearms and Explosives, even at hearings at the US Congress. The fact remains that more than 90% of small arms enter Mexico through our Northern border, regardless of whether they are US-made or manufactured elsewhere. So there seems to be a stark dispute, between this Small Arms Survey and the numbers used by Mexico's government and Mission to the UN. How to resolve the discrepancy? Writing in The New Yorker of May 31, William Finnegan ("Silver or Lead," Plata o Plomo) tried this nuance: "More than eighty percent of the weapons that have been seized in Mexico and that could be traced originated in the US." But Berman of the Small Arms Survey said that was at least one more screen -- it was a percentage of (1) weapons seized in Mexico that (2) Mexico sent to the US for identification and that (3) could be traced. And Berman specifically disputed the 80% figure. The Small Arms Survey was presented to UN member states on June 14. Apparently, Mexico wasn't there. Now what? Can each side simply use their own numbers? Whatever happened to that old saw of debating, you are entitled to your own opinion, but not to your own facts? Watch this site. 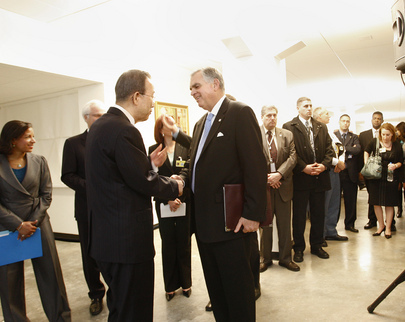 UNITED NATIONS, May 19 -- In one of the stranger press stakeouts at the UN of late, US Transportation Secretary Ray LaHood appeared Wednesday to talk about distracted driving. Even during a four second text message, he said, a car travels the length of a football field. Inner City Press asked LaHood about a controversy in the news, the US's refusal to allow Mexican trucks into the country, contrary to NAFTA. LaHood replied that "Mexican trucks have nothing to do with distracted driving." Video here, from Minute 21:16. But the issue is sure to arise during President Calderon's state dinner with Barack Obama. And LaHood went on to praise prohibiting truck drivers from texting. Since Jennifer Smith of Focus Driven had also denounced the use of "handsfree" devices while driving, Inner City Press asked if Wednesday's call also targeted this form of distraction. "All are distractions," LaHood said. UN Secretary General Ban Ki-moon, who did not stay to answer any questions, had announced an Administrative Instruction prohibiting UN personnel from texting while driving. But when Inner City Press later asked Ban's spokesman how this would be enforced, what the penalties were, the spokesman said the AI is not yet in place. Nor could he answer about UN staff in Cyprus causing a crash that killed two Bulgarians. While few reporters asked questions, more than a dozen were present, drawn by the presence of US Ambassador Susan Rice and Russia's Vitaly Churkin, hoping one or both might speak about Iran. She did not. When Ray LaHood spoke of anti-texting legislation in "countries including... Taiwan," Ambassador Rice reacted. In the UN, it's "Taiwan Province of China." LaHood did not clarify. Video here. In fact, even a question addressed to Ambassador Churkin, LaHood stepped in to answer, touting the Obama administration's spending. Afterwards, Churkin said that while LaHood had promoted Obama's agenda, he Churkin would now speak for the international community. The day after the US's sponsoring of a draft resolution to impose sanctions on Iran was met by a Brazilian vow not to engage, and similar skepticism by Turkey, the US's showing at the driving stakeout seemed, in a word, distracted. LaHood also tipped his hat to the couple in his remarks. But what does Ms. Power, who literally wrote the book on genocide, have to say about the UN's and US Mission's positions on Sri Lanka, compared to the ICG report? While like Mexican trucks not related to distracted driving, these are questions needing answers. Watch this site.